Owing to our wide market presence, we are engaged in manufacturing a premium quality range of Process Reactor. 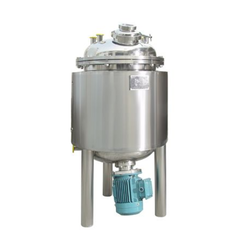 We are leading manufacture of Reactor Vessel. Our clients can avail form us a gamut of chemical process reactors that has a capacity ranging from 100 liters to 20, 000 liters. Fabricated using premium quality stainless steel and mild steel, these chemical process reactors are provided with a rubber lining, brick lining and the lead bond. We are engaged in manufacturing wide range of Process Reactor to our respected clients. Manufactured using high quality raw material, these tanks are appreciated for their durability and corrosion resistant nature. Up-flow Anaerobic Sludge Blanket (UASB) is the most widely used high rate anaerobic system for anaerobic sewage treatment. We offer a wide range of reaction vessels that are complete with different accessories. Tubular stands can be offered with clamps for the vessels, stirrers and other apparatus. The interior and jacket of the vessel are manufactured in line to ensure that the flow circulation of the heating fluid in the jacket is unvarying.